Three countries share Lake Constance, the communities of Switzerland, Germany and Austria facing each other across the water. Nowadays you can cross the border without formality – don’t tell anyone, but I spent an afternoon in Austrian Bregenz without a single piece of identification having left it behind in Germany – and there are plenty of boats that criss-cross the lake. The owner of our apartment lived in one country, worked in another, and no doubt went on Sunday bike rides in the third. There is another way to make these international journeys, although on average the opportunity strikes only a couple of times a century, if that, and that is when Lake Constance freezes over. 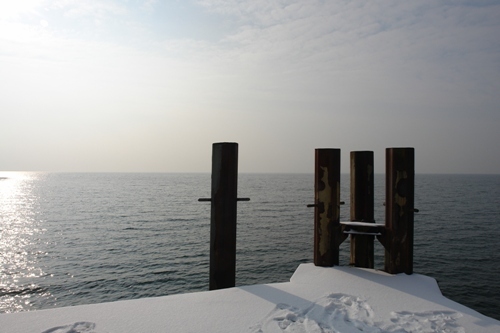 Since 875, when reliable records began to the kept in the churches on the lake shore, the Bodensee (as it is known to German-speakers) has frozen completely only 34 times. The last occasion was in 1963, when thousands of people crossed from one shore to the other on foot, horseback, and even driving a Volkswagen Beetle. 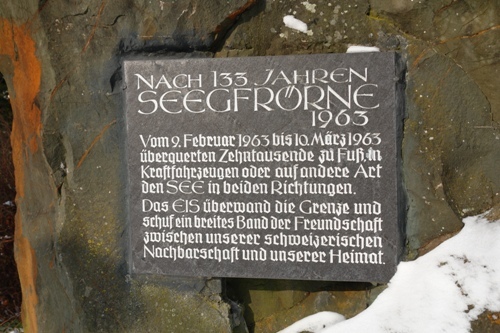 In Nonnenhorn, on the German shore, two ceremonial stones have been placed to commemorate this event and the earlier “big freeze” in 1830, and the connections with the Swiss town of Rorschach that have built up thanks to these uncommon natural events. Last time around a couple of farmer’s sons from Switzerland headed across the ice with a walnut tree sapling that was planted in the Nonnenhorn schoolyard, when it shades the local children to this day. And the tree was not the only gift that came across the ice. Ever since 1573, a bust of St John has been transported between the monastery church in Münsterlingen (Switzerland) and Hagnau on the opposite bank. With each freeze the bust changes hands, and is currently residing in Münsterlingen. Traditions such as these, and the records kept commemorating them, have been used in recent years by scientists attempting to track climate change, as data from Lake Constance is compared to those compiled in Shinto shrines in Japan and the sailing logs of Alaskan fishermen. The last gap between freezes was 133 years, and who knows what effect climate change will have on the temperature of Lake Constance. If it takes that long again, then the next time St John will be making his journey across the ice it will be 2096. But make that journey he almost certainly will, along with thousands of others, whether on foot, in an electric Beetle, or those hoverboards they promised us when I was a kid. This entry was posted in Memory, Places on January 19, 2012 by Paul Scraton.